Collingswood resident Elizabeth Scannell-Desch, an associate dean at the Rutgers School of Nursing–Camden, has been selected as one of only three New Jersey nursing professionals for induction as a Fellow in the American Academy of Nursing, one of the highest honors that can be bestowed in that field. Elizabeth Scannell-Desch served as command nurse executive at U.S. Air Force headquarters at the Pentagon. American Academy of Nursing Fellows represent “the ranks of the nation’s foremost health care thought leaders,” according to AAN President Bobbie Berkowitz. Selection criteria include evidence of significant contributions to nursing and health care, and the extent to which nominees’ nursing careers influence health policies and health care delivery for the benefit of all Americans. Only 173 nursing professionals in the world were selected for this honor during 2017. They will be inducted during the AAN’s annual conference in Washington, D.C., on Oct. 5. 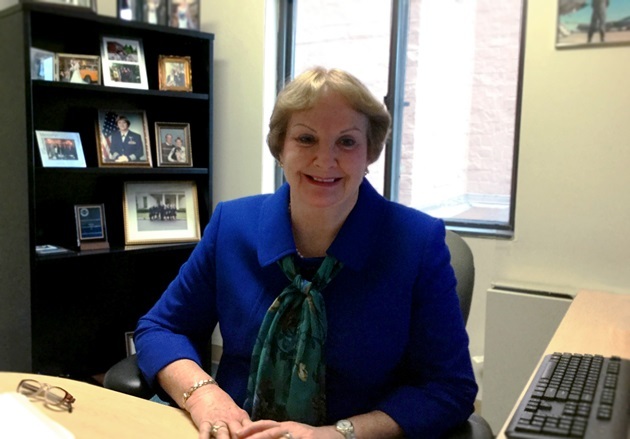 Scannell-Desch, associate dean for baccalaureate programs at the Rutgers School of Nursing–Camden, is coauthor of the books Nurses after War: The Reintegration Experience of Nurses returning from the Iraq and Afghanistan Wars (Springer, 2016) and Nurses in War: Voices from Iraq and Afghanistan (Springer, 2012). A retired colonel in the U.S. Air Force Nurse Corps, Scannell-Desch joined the Rutgers–Camden faculty in January 2016 after a 25-year military career and 15 years teaching at other universities. A former flight nurse, Scannell-Desch served on active duty all over the world from 1972 to 1997. During that time, she held a number of key leadership positions, including command nurse executive at U.S. Air Force headquarters at the Pentagon, where she directed nursing policy and practice for Air Force Reserve nursing personnel worldwide and served as senior nursing advisor to the Air Force Reserve commanding general. A noted scholar on such diverse issues as nurses in the military, the impact of mid-life widowhood, and oncology, Scannell-Desch is the recipient of multiple honors and awards. She has presented her research at scholarly conferences worldwide. She serves as a peer reviewer for the Military Medicine Journal published by the American Association of Military Surgeons of the United States. Scannell-Desch received her bachelor’s degree in nursing from Mount Saint Mary College in 1972 and her master’s degree in nursing from the University of Pennsylvania in 1980. She earned her doctoral degree in nursing from Georgia State University in 1992. Learn more about the Rutgers School of Nursing–Camden.